Every so many Fridays I’d like to do a new feature here on the blog called Freaky Friday where I get to delve into the nonsensical part of me. There’s something about removing inhibitions and just being goofy that is very liberating. It’s also exposing and that can be a little nerve-wracking. You may see a side of me that you find shocking, frightening, or even just bizarre. Please, don’t judge me as a whole based on these posts. I am all of the above at times but never one all the time. So, recently I had the opportunity to interiview a popular childhood icon. The coversation went something like this. Mike Dellosso: Hi George, thanks for taking the time to speak with me. How have things been going for you? George Porgie: Not the greatest. I made one mistake and got slapped with a label that’s followed me around my whole life. MD: Let’s go back to that time and set the stage. You were a kid, right? And everyone called you Georgie. GP: I guess. I mean, yeah, they called me Georgie. It was a name my mom gave me, and my aunt. Everything was Georgie this, Georgie that. Isn’t Georgie so cute. MD: So were you okay with Georgie Porgie? GP: No, not really. I wanted to be called George or maybe just “G” but what was I going to do? MD: But it gets worse, doesn’t it? GP: Don’t even go there. MD: Puddin’ Pie? What’s up with that? GP: My mom again. And my aunt. My cheeks were so pudgy they used to squeeze them and say they felt like pudding pie. Plus I liked to eat pudding pie. GP: Yeah, tell me about it. MD: So what happened on the playground that day? GP: What do you mean? MD: Do you remember their names? GP: Sure I do. Emma, Sharon, and Lucy. MD: And what happened then? GP: We were alone and I kissed them. On the cheek. Look, it was no big deal. Everyone’s made such a big deal about it. MD: Why did you kiss them? I mean, that’s kinda weird, don’t you think? Enough to frighten any girl? GP: I don’t know. It just happened. They wanted the swings and I wasn’t about to give up the best swing. I was there first. So I kissed them. On the cheek. MD: And what happened after that? GP: They started to cry like girls. MD: They were girls. Was that the intended reaction? GP: No. Maybe. I don’t know. Look, I was a dumb kid with chubby cheeks. Geez. Talk about a misunderstanding. MD: But that’s not all, is it? GP: Well you know the story. Everyone does. These guys came out then. MD: And they saw the girls crying. MD: And what did you do? GP: I don’t understand the question. MD: Georgie, you ran away, didn’t you? GP: Well wouldn’t you? I mean it was like four to one, is that fair? No. No, it’s not fair, but everyone makes me out to be some chubby wimp, kissing girls and running away from their protectors. It didn’t happen like that. MD: No one ever said you were chubby. I had the unique opportunity to interview Michael Hyatt , Chairman of Thomas Nelson, last night in preparation for the upcoming ACFW conference in Dallas in September where Michael will be the keynote speaker. The full interview will appear in the ACFW’s Journal but I wanted to share some memorable quotes. Back in 1986, as a 14-year-old I read a book called This Present Darkness by some guy named Frank Peretti. I knew nothing of Frank, not much of Christian fiction, and wasn’t really into suspense at the time. As it did most readers, the book captivated my imagination. It was the first contemporary novel I read that I felt I couldn’t put down. Then came Piercing the Darkness, Prophet, The Oath, and The Visitation and I was a sold-out Peretti fan. A few years later came Monster and I wanted to move to the north country of Idaho. Now, after seven years, comes Illusion, another soul-stirring story of love and mystery. Almost ten years ago, when I decided to dive into the fiction writing pool myself I was given the advice to find an author I admire and who inspires me and read his or her work, not for the enjoyment of it, but to learn from it. I turned to Frank Peretti. I had the opportunity to ask Frank a few questions and below are his answers. 1. Why did you choose to use magic and Illusion as a framework for this book? Secondly, Mandy’s sudden, unexplainable ability to create and perform such mysterious effects works right into the whole interdimensional, time bending element, the“sci-fi bad guy” intrigue of the story. 2. What interests do you have outside of writing? Music. I have played the 5 string banjo for over 20 years and now I’m seriously studying the guitar. I lead worship at my local church which means I lead a worship band including musicians and singers. That’s a lot of fun, and always a creative challenge. It’s also a marvelous environment for learning how to work with people. I love flying and still have a current pilot’s license, but alas, flying is getting too expensive and I don’t do much of it anymore. I also love motion pictures and I’ve done some video production, but I guess that’s going to remain at the level of a hobby. Well, okay. 3. What is the main idea you want people to take home after they read your books? I’ll go ahead and sound religious: I would like to create stories that glorify God and the things He has created, in this case, steadfast love, devotion, the joy of having someone. I would like to convey truth, celebrate beauty, warn against evil, admonish and ennoble. 4. What authors do you like to read? Any author I can learn from. I keep my eyes open for the good stuff that comes along. Francis Schaeffer, Ravi Zacharias, and CS Lewis have been strong influences in my intellectual life. Michael Crichton has been a favorite author of mine because of the way he can put together a technothriller. He’s always been a really great model for structuring a story. Besides these, I like to read other fiction authors to learn from them, to see how they craft their stories, develop their style, and work with words. You never stop learning, growing, getting better at what you do. 5. Which book that you have written has been the most influential for you personally? Well, I guess I would speak in the present tense and in terms of where my heart is right now and say Illusion. I’m 61 years of age, I was writing this book just as I was turning 60, and at that time I was reflecting on my life and my love relationship of 40 years with Barbara Jean. Like any artist, I was trying to convey something from my heart, trying to paint with words some very deep feelings and reflections. Writing Illusion deepened all the more my love for my wife and illuminated all that our marriage and our love has meant. Visit the Ask Frank landing page and check out the other blogs participating. There’s a wide array of bloggers. Check out the book on Frank’s site and order a copy today. 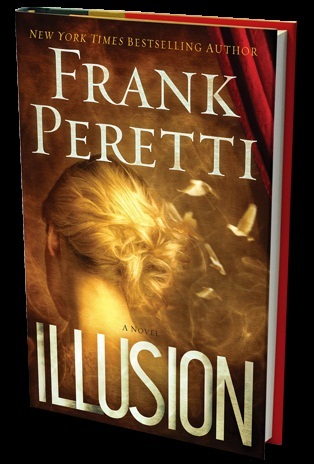 To celebrate this latest offering from a true mentor of mine, I’m offering an advanced reader’s copy of Illusion. Just leave a comment on this post about anything Peretti-related or anything at all and you’ll be entered into the drawing. The winner will be announced Thursday morning. Check it out. Lots of fun and intrigue and some good life lessons . . . ! Here’s where you can get your copy. And please help spread the word by sharing the page with your Facebook and Twitter friends. Comments Off on Last Day to SCREAM! First, I’d like to thank everyone who has been spreading the word about the release of FRANTIC. What you do is important, no matter how small it may seem. You make a difference and I appreciate every one of you. THANK YOU! Second, today brings another day of guest-blogging, and more giveaways for a chance to win a copy of FRANTIC. Check out these sites . . .
Also, don’t forget to visit these blogs and post a comment for a chance to win a copy of FRANTIC. They’re still running their giveaways! Now, have you ordered or purchased your copy of FRANTIC yet? You can get a copy here. Or for your Kindle. Or for your Nook. Also here’s where you can get your free download of SCREAM. Or for your Nook. Order it today, the offer only lasts until February 14! Nora St. Laurent over at “Finding Hope Through Fiction” recently interviewed me for the American Christian Fiction Writers book club pick for February. The interview is now posted here and you can win a free copy of Darlington Woods. Besides that, it was a fun interview and she included lots of interesting graphics and pics. Check it out. It’s worth a few minutes of your time. Okay, here’s some really cool stuff for you and it’s all free (that’s something you don’t hear very often nowadays). My publisher and I have come together to offer you, the reader, some great free downloads. Thoughts and annotations on all three of my books, video trailers, sample chapters, an interview, short stories, and some other neat stuff. And we’ll be adding to it in the near future too. Here’s how you unlock these downloads (really, it’s quick and easy). Go to http://www.strangbookgroup.com/download/ and, if it’s your first time, register (again, easy as pie to do). Once you’re registered you’ll need the 12 digit code for my stuff. It’s DELLOSSO5410. Just plug that code in, hit the button and voila, free stuff to download. And like I said, visit back from time to time because I’ll be sending them new stuff to add from here and there. Photos, another short story, that kind of stuff. Also, remember my Darlington Woods Contest with all kinds of great prizes including a study bible, free books, and a chance to have a character named after you in my next book is still going on. The deadline is June 30. Hit the Contest button at the top of this page and read all the details, then enter! Check out Part Two of my interview with Nicole Petrino-Salter. She asked some pretty personal and tough questions! Check out Part One of a two-part interview I did with Nicole Petrino-Salter. Some pretty revealing stuff . . . and fun too!